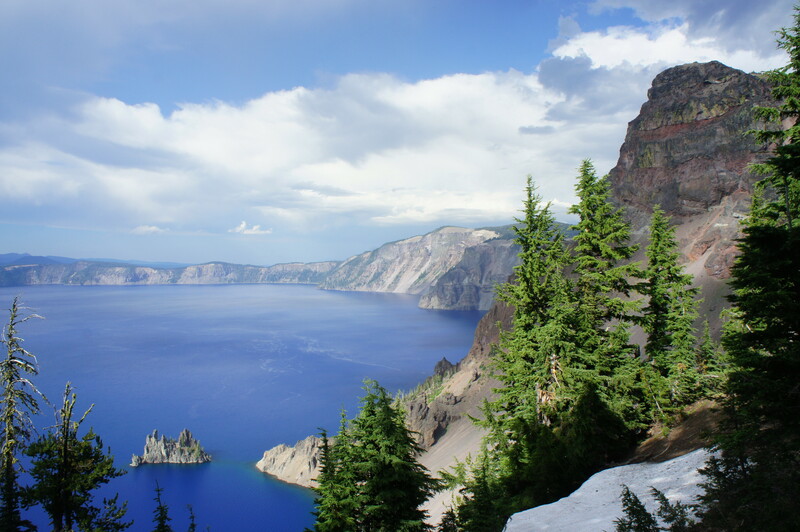 Sandwiched between two precipitous peaks, the Sun Notch Trail is a short and scenic circuit hike in Oregon’s Crater Lake National Park that features five fine views of Crater Lake in quick succession. From the caldera rim, situated atop a cliff that drops more than 1,000 feet, hikers can see Wizard Island, the Phantom Ship, Applegate Peak, Dutton Cliff, and Mount Thielsen. Considered ADA-accessible by the park, the loop nonetheless has steep inclines that make pushing wheelchairs quite difficult. 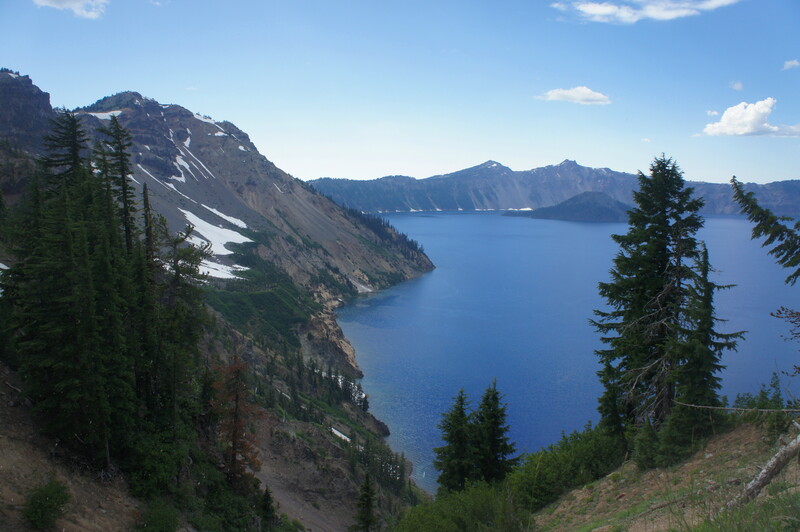 Sun Notch is situated off the East Rim Drive in Crater Lake National Park at the end of a long bend around Sun Meadow. A small parking area on the north side of the road marks the beginning of the short hike. From the parking area, the Sun Notch Trail bears northwest through a stand of hemlocks, firs, and pines, eventually climbing to the edge of a sloping meadow. Here the trail splits, marking the start of the loop portion. Head left, rounding the circuit in a clockwise direction. The rocky promontory to the west is Applegate Peak (8,126’); to the east is Dutton Ridge (8,147’), a gently sloping mountain that ends abruptly at Dutton Cliff. At about 2/10 mile, the wide and dusty path rounds a single switchback, then bears northeast toward the edge of the cliff. 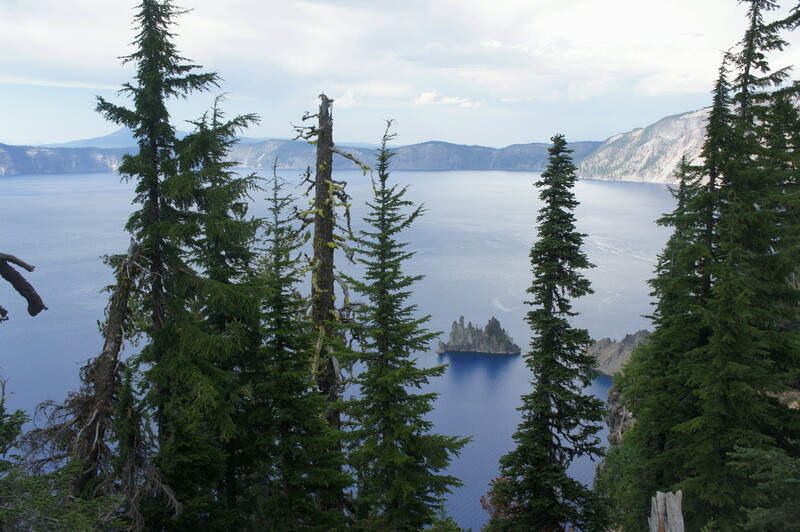 Just past ¼ mile, hikers will come across the first of five viewpoints, a window overlooking Crater Lake with a framed view of the Phantom Ship, a small island that juts 170 feet out of the water. 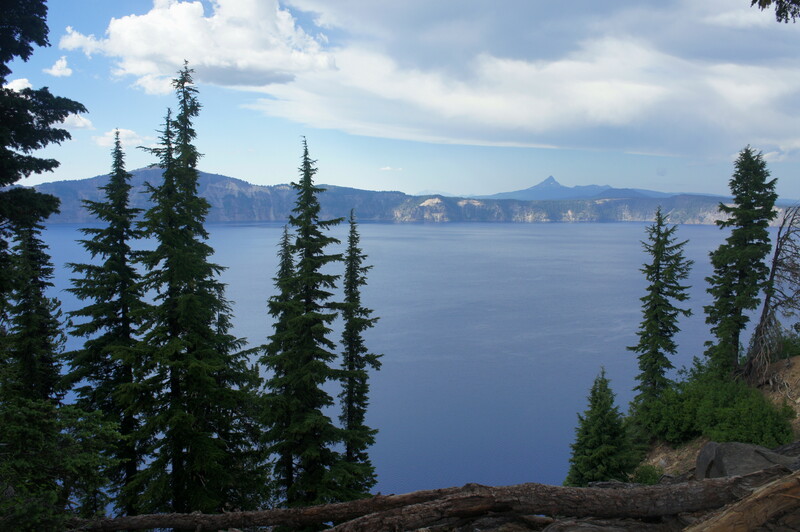 The second viewpoint, situated a minute up the trail, provides a clear view across Crater Lake to sharp-sided Mount Thielsen (9,182’), the highest peak in the area. A third vista, just steps farther, peeks through an aperture to the northwest, where Wizard Island (6,940’) and Hillman Peak (8,151’) come into view. Continuing along the meadow for another 50 yards leads to a fourth overlook on the left. This overlook is particularly dramatic, as the cliffs on the near shore drop nearly 2,000 feet from the summit of Applegate Peak. 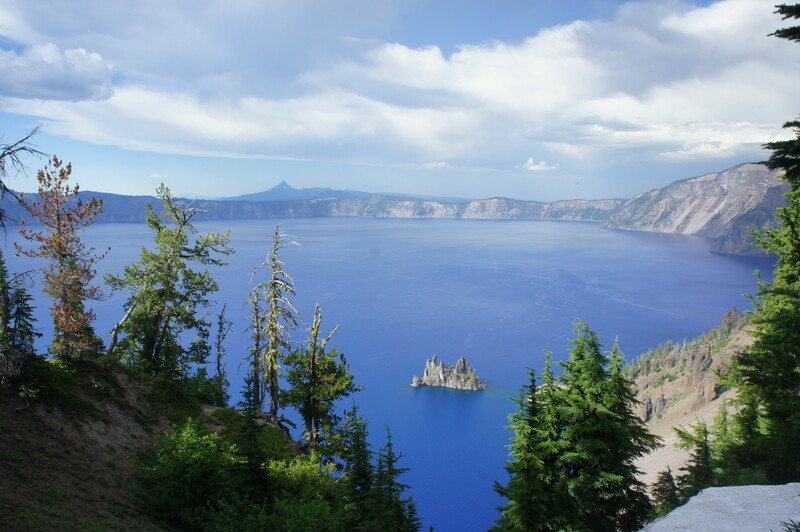 The fifth and final overlook offers another excellent view of the Phantom Ship and the multi-hued face of Dutton Cliff, an intimidating precipice high above the blue waters of Crater Lake. 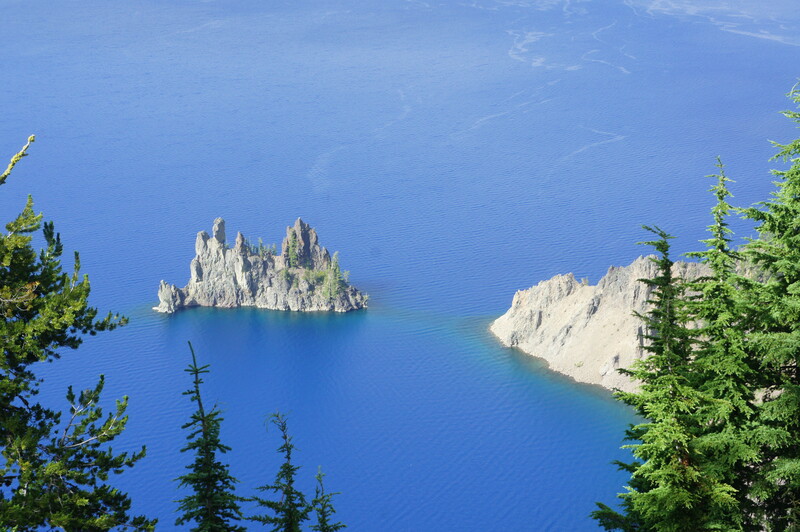 Further afield, Cloudcap (8,065’) towers over the lake’s eastern shores, with the cliffs around Cleetwood Cove beyond. 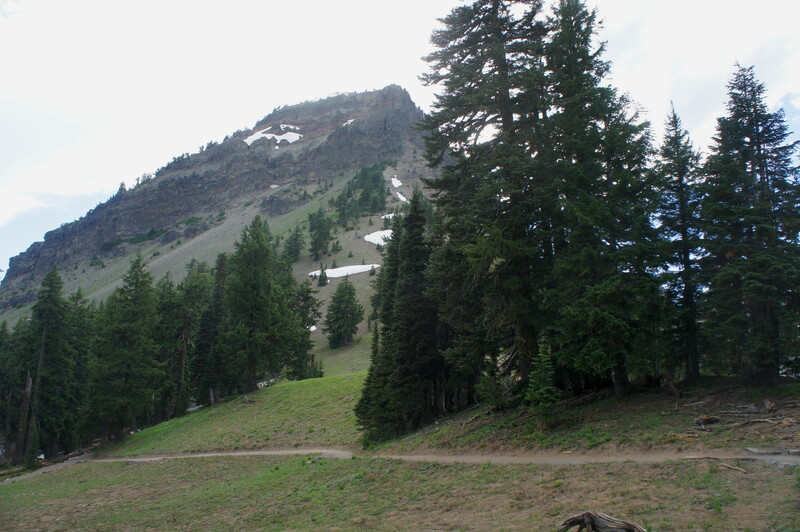 At around 4/10 mile, the path begins to turn south, leaving the rim. Cutting across the meadow, the Sun Notch Trail descends back into a wooden patch. Now bearing west, the trail returns to the start of the loop at about 2/3 mile. From here, bear left and continue 1/10 mile back to the parking area. 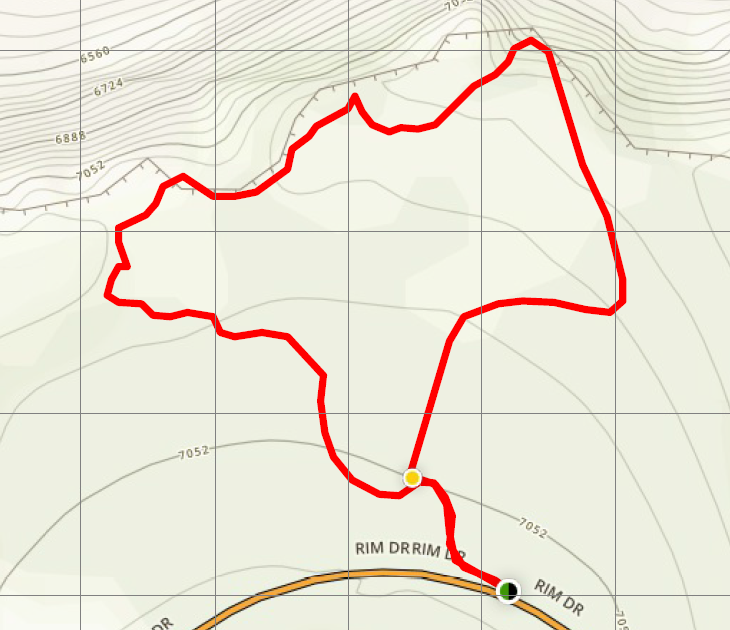 Allot around 30-45 minutes for this short hike, one of the park’s easiest. 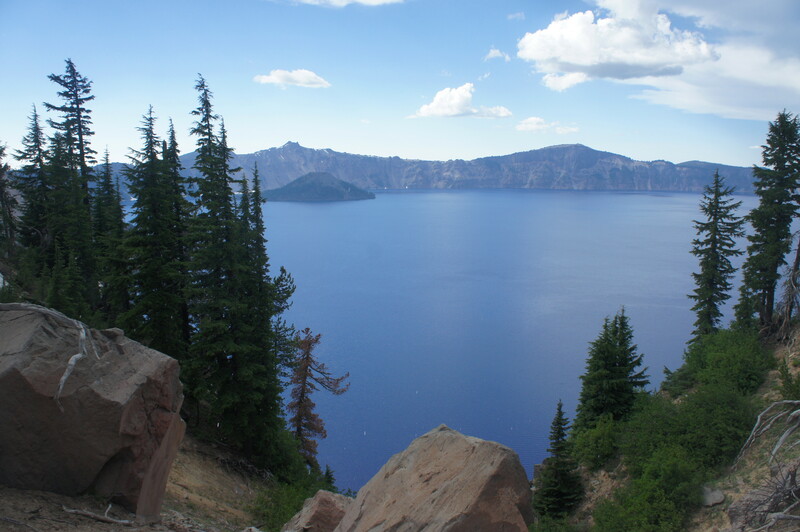 This entry was posted in Crater Lake National Park, Easy Hikes, Oregon and tagged Applegate Peak, Crater Lake, Dutton Cliff, loop hike, Oregon, Phantom Ship, wheelchair-accessible. Bookmark the permalink.